This tasteful architect designed home has been constructed specifically to take advantage of the magnificent Byron Bay lifestyle. It is situated on the beachside in the quiet country style Cavvanbah Lane nestled between Shirley St and Cavvanbah St and designed to enjoy the spectacular outlook and ambience of rainforest like surrounds. This is a home that truly embraces everything that Byron Bay stands for but also indulges in every luxury necessary for the most relaxing holiday. 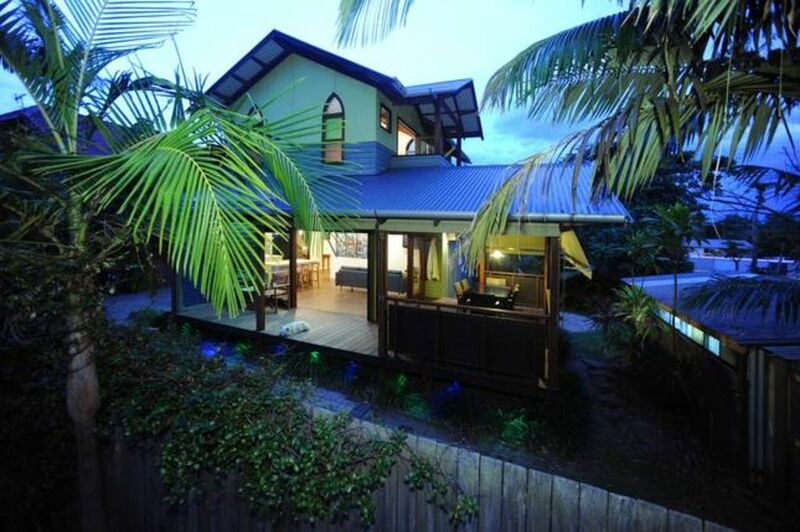 This home was designed with the Blues in mind influenced by the ever popular annual Byron Bay Bluesfest. The spectacular stained glass church windows that feature throughout are truly a work of craftsmanship and set the theme for the home. Soaring cathedral ceilings feature exposed beams and natural timber finishes provide earthy aesthetics. Outdoors and indoors are loosely defined in the living areas as they open to the huge wrap around deck making for ideal family entertaining and relaxation. There are three bedrooms and two bathrooms in total . A main bedroom retreat on the upper level is breathtakingly luxurious and boasts a spectacular outlook to the mountains from its own little balcony. Accessed via the lane this home is set in a truly peaceful country style location. It is less than a 10 minute walk to all the attractions of vibrant Jonson St and only a 2 minute walk with no roads to cross to a magnificent stretch of beach situated about half way between Main Beach and Belongil Beach. The coastal forest track to the beach is a most pleasant sandy path. The huge tree in the corner of the property is a haven for birdlife that combined with the sounds of the nearby rolling surf will provide for you the setting for the ultimately relaxing holiday experience. Thanks for having us. I enjoyed parking the car up and having a chilled long weekend away in beautiful Byron Bay with my family. Lovely house, very clean. Great location. Some issues. We enjoyed our stay apart from some minor issues. No hand soap in the upstairs bathroom. Toilet paper downstairs ran out Day 1. Towels and quilt upstairs were threadbare/scratchy. Bed and pillows very hard and uncomfortable. For the price, would have expected better quality and few “extras” like a spare roll of toilet paper, soap, maybe small bath foam would have been included. I find it a very comfortable home personally and love staying there. I have no idea how 4 rolls of toilet paper were used on day 1. We use hotel quality linen service. The king size beds are super comfortable the pillows are replaced regularly and the other linens are all well maintained and replaced. It is a beautiful holiday house - not a hotel - it is private and secure and spacious. Once again we love it and I reckon you will too. Any gripes call me on as they happen and we will do our best to make you happy. We enjoyed the privacy and relaxed feeling staying at the home. We enjoyed our stay at Byron Bliss. The house was clean, well appointed and comfortable. Peter was extremely friendly and helpful. We stayed during the sinter and the heat pumps were excellent to keep the house warm at night. Whilst the house is handy to shops and restaurants, it is close to a very busy road and traffic noise could be an issue if you're used to a rural environment. The house doesn't get much sun in the winter however we could imagine it would be a lovely cool spot in the heat of summer. I disagree re noisy road as it is a quiet lane and about 100 m from busy Shirley st . Plenty of sunny spots. We love it there!